Some historians rate Woodrow Wilson as a near-great president, which always made me curious because he is most remembered for his idealistic League of Nations proposal, which his own country shunned. 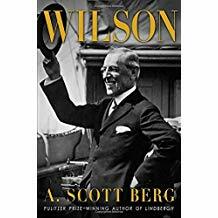 So my curiosity led me to Wilson, a highly rated biography by A. Scott Berg. The truth is Woodrow Wilson lived a life of remarkable accomplishment. He was an academic with a list of history and political science books to his credit. From 1902 to 1910 he was President of Princeton University and was credited with helping transform what was a school for social elites into a modern university. His academic reputation led him to politics, and as Governor of New Jersey from 1911 to 1913, he broke with the party bosses who had supported him and came to national attention as a progressive reformer, and quickly to the Presidency in the election of 1912. As President, Wilson’s accomplishments included establishing the income tax with the Revenue Act of 1913, the Federal Reserve Act which created the Federal Reserve System, the Federal Trade Commission Act, and the Clayton Antitrust Act. And he is probably best known for his Fourteen Points, which outlined his building blocks for a lasting peace, and the League of Nations to make future wars unlikely. Also, there were real parallels between today’s political climate and the era of World War I and its aftermath. Like the present era, there was a Congress being obstructionist for partisan political gain (as Wilson was leaving for the peace talks, Republican senators decided to oppose whatever deal he brought back), and a wave of nationalism (anything German was considered unpatriotic; sauerkraut was referred to as “liberty cabbage”). Wilson did have his faults. He was raised in the South, and his views on race relations reflected his upbringing. There was also a violent miner’s strike in Colorado in 1914. And perhaps his worst fault was stubbornness — if he had been more flexible on the League of Nations, he likely could’ve reached a compromise with his political opponents (who were anxious for some credit) and seen the Treaty of Versailles ratified. Or maybe he was just that far ahead of his time on foreign affairs.